I’ve often rolled my eyes at the thought of detoxes and cleanses. Three days of drinking spicy lemon juice and living on the toilet sound pretty terrible. Without actual food I would be a miserable human. If I attempted one, my husband and son would need to move out for a few days or else incur my uncontrolled wrath. That being said our recent vacation was rough, diet wise. Lots of chips, booze and sweets. When we stopped for a bite on the drive home, even my meat and potatoes husband ordered a salad for lunch. After eating like that for an extended time, it’s hard to break those awful habits. I’ve found myself craving all those bad things even more than normal. I need something to help curb the cravings. 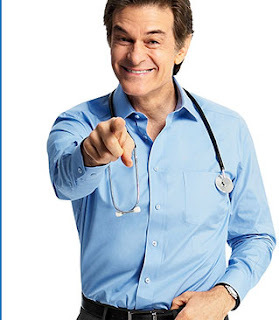 That’s where Dr. Oz comes in. I don’t regularly watch Dr. Oz. I don’t worship at his alter. I have nothing against him, I just find myself getting grossed out any time I’ve watched his show. He liked to talk a lot about poop. Ain’t nobody got time for that. Still, his Three Day Cleanse intrigued me. I first heard about it while watching his show at the gym. I only saw a few minutes before the jerk next to me turned to Fox News without asking. But what I saw, I liked. It was a cleanse, but it involved actual food. Lots of food. Food I liked. It equaled out to about 1400 calories a day. It boils down to this- 3 different smoothies a day, plus you can pick any one of the 3 to have again as a snack. You also get green tea, probiotics, multi-vitamin and fish oil supplement. Seems simple enough. I tried it several months ago and felt really good after it, though I did cheat a tiny bit. Plus, I had some extenuating circumstances that made it especially hard. I decided to try it again to get out of my post vacation funk. All of the ingredients are easy to find but it can be pricey if you don’t have things like coconut oil, flax seed and the supplements on hand. Also, Dr. Oz says buy all organic but I don’t have Dr. Oz money so I slummed it with the various pesticides that may kill me. I also bought lots of frozen stuff too, because I’m lazy. The day before starting the cleanse I cut and froze all my fresh fruits and veggies. When you are starving, it’s much easier to dump all the ingredients into the blender than taking 30 minutes to clean, peel and chop. Plus, I have a crappy blender (more on that tomorrow) and pre-cutting the produce makes for a smoother blend. You don’t have to freeze the produce either but as someone with a lot of texture issues, I find it much easier to drink smoothies that are cold. Also, Dr. Oz recommends eating a “clean” healthy meal the night before. I stuffed my face on Lamb Korma, red wine and garlic naan at a girls dinner. Oh well. So join me as I attempt to “cleanse” and try kill some of those cravings I developed from a week of bad habits. 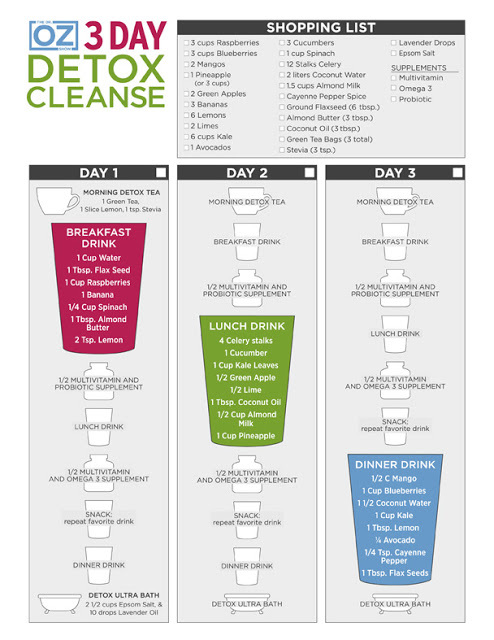 If you have any questions about the cleanse or my experience, feel free to ask in the comments. I’m not clinicial, nor am I affiliated with Dr Oz, but I am willing to share my experience.